Tight head or open top. Electrically welded side seam, with ends/bottom double or triple seamed and solutioned. Pressed out rolling hoops in body (W section hoops available). Open tops have a head formed to take a sealing gasket to fit the body curl. Galvanised ring with either interal or external quick release lever, two prong latch fastener or screw closure with nut and bolt. Tight head or open top. Electrically welded side seam, with ends/bottom double or triple seamed and solutioned. Pressed out rolling hoops in body (W section hoops available).Open tops have a head formed to take a sealing gasket to fit the body curl. The powder lacquer plant installed at Metal Drum was the first in the UK and only the second in Europe. 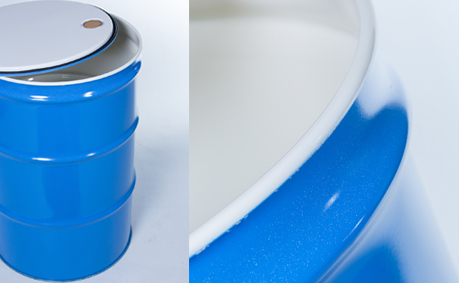 Powder lacquers are solvent free which eliminates the problem of VOC emissions, this is very important for both drum manufacturers and end users in light of current and ever increasing environmental standards. Further to its environmental benefits, powder lacquer is also very durable and has an excellent chemical resistance to organic solvents as well as mineral acids.